The liver is located in the upper right-hand portion of the abdominal cavity, beneath the diaphragm and on top of the stomach, right kidney and intestines. It has two main lobes, both of which are made up of eight segments. The segments are made up of a thousand lobules. The lobules are connected to small ducts that connect with larger ducts to ultimately form the common hepatic duct. 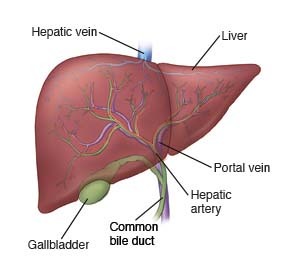 The common hepatic duct transports bile produced by the liver cells to the gallbladder and duodenum (the first part of the small intestine). The liver’s main jobs are to control most chemical levels in the blood and excrete a product called bile. Bile helps to break down fats, preparing them for further digestion and absorption. All of the blood leaving the stomach and intestines passes through the liver. The liver processes this blood and breaks down, balances and creates nutrients for the body to use. It also metabolizes drugs in the blood into forms that are easier for the body to use. When the liver has broken down harmful substances, they are excreted into the bile or blood. Bile by-products enter the intestine and ultimately leave the body in the feces. Blood by-products are filtered out by the kidneys and leave the body in the form of urine. Biliary atresia is a chronic, progressive liver problem that becomes evident shortly after birth. In biliary atresia, bile ducts in the liver are blocked. When the bile is unable to leave the liver through the bile ducts, the liver becomes damaged and many vital body functions are affected. Learn more about biliary atresia. Hepatitis is an inflammation of the liver and can result in liver cell damage and destruction. Hepatitis is a concern because it often originates from a virus and can be spread to others. Learn more about hepatitis. Hemochromatosis (also called iron overload disease). This disease is characterized by the absorption of too much iron from food. Instead of secreting the excess iron, the iron is stored throughout the body, including the liver and pancreas. The excess iron can damage these organs. Hemochromatosis is a hereditary disease that can lead to liver disease, liver failure, liver cancer, heart disease and diabetes. Wilson disease. This disease is characterized by the retention of too much copper in the liver. Instead of releasing the copper into the bile, the liver retains the copper. Eventually, the damaged liver releases copper into the bloodstream. This hereditary disease can cause damage to the kidneys, brain and eyes, and can lead to severe brain damage, liver failure and death. Someone who has fat deposits in their liver has fatty liver disease. These deposits may keep the liver from doing a good job of removing toxins from your blood. Learn more about fatty liver disease. Cirrhosis is damage to the liver that decreases blood flow through it over time. As the normal liver tissue is lost, nutrients, hormones, drugs and poisons are not processed by the liver as they should. In addition, protein production and other substances produced by the liver are decreased or stopped all together. Learn more about cirrhosis. Jaundice is a yellow discoloration of the skin and whites of the eyes due to abnormally high levels of bilirubin (bile pigment) in the bloodstream. Urine is usually dark because of the bilirubin excreted through the kidneys. High levels of bilirubin may be attributed to inflammation, or other abnormalities of the liver cells, or blockage of the bile ducts. Sometimes, jaundice is caused by the breakdown of a large number of red blood cells, which can occur in newborns. Jaundice is usually the first sign, and sometimes the only sign, of liver disease. Learn more about jaundice. Cholestasis means any condition in which bile flow is reduced or stopped. "Chole" refers to bile and "stasis" means "not moving." Bile flow may be blocked inside the liver, outside the liver or in both places. Learn more about cholestasis. Portal hypertension is high blood pressure in the portal vein, which supplies the liver with blood from the intestine and spleen. Portal hypertension may be due to increased blood pressure in the portal blood vessels, or resistance to blood flow through the liver. Portal hypertension can lead to the growth of new blood vessels (called collaterals) that connect blood flow from the intestine to the general circulation, bypassing the liver. When this occurs, substances that are normally removed by the liver pass into the general circulation. Learn more about portal hypertension. Anemia, a condition that indicates a low red blood cell count. Ascites is fluid buildup in the abdominal cavity caused by fluid leaks from the surface of the liver and intestine. Ascites due to liver disease usually accompanies other liver disease characteristics, such as portal hypertension. Symptoms of ascites may include a distended abdominal cavity, which causes discomfort and shortness of breath. Learn more about ascites.